In restaurants White Out makes the dining space akin to a gallery space in which food and patrons become art. NIL bar and restaurant (1998) in Rome, Italy offers another iteration of White Out, one where electrically controlled Soft Walls of fabric become digital canvases for dramatic color variations. A video-projector system floods the interior with moving colors. “The space can become pink or blue; optical or polka dot, water; fire or forest or be covered in images of magnetic waves, television interferences, or images from the biological world.” Video art works by artists Paolo Canevari and Adrian Tranquilli have also been exhibited.7 In one of the four rooms, a continuous round banquette with a padded seat and back, white tables with smooth tops and Bertoia chairs flank the perimeter of the space, leaving the center floor area open for display of the various lighting and color effects. The clientele who sit on the banquette seat with their backs to the fabric soft wall also become part of the canvas. The Restaurant in the Hospes Amerigo Hotel also has a unique setting. The 59-room boutique hotel is located in a former Dominican convent in the center of the old city of Alicante, Spain. The restaurant, designed in 2006 by interior designer Elvira Blanco, is a formal space of thick-walls where one can have a meal with proper service. Lighting of this restaurant is very soft with yellow ambient fixtures. The entire setting is based on the White Out practice; tables and chairs are covered with white cloths to allow color to arise from the dishes and the patrons.9 The chair black legs provide the only accent. 1) Marta R. Méndez, “Theory Studies: Archetypical Practices of Contemporary House Design” (MA Thesis, Cornell University, 2008), 130-33; Leah Scolere, “Theory Studies: Contemporary Retail Design” (MA Thesis, Cornell University, 2004), 28-33; Joori Suh, “Theory Studies: Contemporary Museum and Exhibition Spaces” (MA Thesis, Cornell University, 2003), 94-98. 2) Brian O’Doherty, Inside the White Cube: The Ideology of the Gallery Space (Santa Monica: The Lapis Press, 1986), 14, 15. 3) For White Box that also has examples of White Out, see Julie Yang, Theory Studies: Contemporary Boutique Hotel Designs” (MA Thesis, Cornell University, 2005), 9-11; White Out in Rachel Goldfarb, “Theory Studies: Archetypical Practices of Contemporary Resort and Spa Design,” M.A. Thesis, Cornell University, 2008), 9-11. 4) O’Doherty, Inside the White Cube, 15. 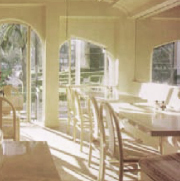 5) Today’s Restaurant  Gary Hutton of Orientations; San Francisco, California in Lois Wagner Green, “Health Food in High Style,” Interior Design 50, no. 6 (June 1979): 164-165. 6) Pomme Fritz  Rolf und Rolf, Cologne, Germany in John G. Tucker, “Pomme Fritz, Cologne: Rolf und Rolf Create a Playful Geometry in Germany,” Interior Design 57, no. 5 (May 1986): 290-291. 7) NIL Bar  Claudi Lazzarini and Carl Pickering; Rome, Italy in Arian Mostaedi, Bars & Restaurants (Barcelona: Carles Broto i Comerma ; Instituto Monsa de Ediciones, S.A., 1999), 94-103. 8) Georges Restaurant  Dominique Jakob and Brendan MacFarlane; Jacob + MacFarlane; Paris, France in Claire Downey, “Georges Paris,” Architectural Record 188, no. 9 (Sept. 2000): 136. 9) Restaurant, Amerigo Hotel  Elvira Blanco; Alicante, Spain in Stacy Shoemaker, “Divine Inspiration,” Hospitality Design 28, no. 1 (Jan./Feb. 2006): 67. 10) Evidence for the use and the chronological sequence of White Out as a restaurant archetype was developed from the following sources: 1970 Today's Restaurant  Gary Hutton of Orientations; San Francisco, CA in Lois Wagner Green, "Health Food in High Style," Interior Design 50, no. 6 (June 1979): 164-165; PhotoCrd: Jamie Ardiles-Arce / 1980 West Hollywood  Diane Gourdal; John G. Tucker, "Good Risk," Interior Design 56, no. 5 (May 1985): 314-315; PhotoCrd: Wayne Shimabukuro; Pomme Fritz  Rolf und Rolf, Cologne, Germany in John G. Tucker, "Pomme Fritz, Cologne: Rolf und Rolf Create a Playful Geometry in Germany," Interior Design 57, no. 5 (May 1986): 290-291; PhotoCrd: Rainer Mader / 1990 NIL Bar  Claudi Lazzarini and Carl Pickering; Rome, Italy in Arian Mostaedi, Bars and Restaurants (Barcelona: Carles Broto i Comerma; Instituto Monsa de Ediciones S.A., 1999), 103; PhotoCrd: Matteo Piazzo / 2000 St. Martins Lane  Philippe Starck and Anda Andrei; London in Melissa Barrett Rhodes, "Room with a Hue," Interior Design 71, no. 1 (Jan. 2000): 122-31; PhotoCrd: Todd Eberle; Georges Restaurant  Dominique Jakob and Brendan MacFarlane; Paris, France in Claire Downey, "Georges Paris," Architectural Record 188 no. 9 (Sep. 2000): 136; PhotoCrd: ArchiPress; Sketch Restaurant and Bar  Mourad Mazouz; London, UK in Joachim Fischer, ed., Restaurant Design (Stuttgart, Germany: Daab Press, 2004), 284-85; PhotoCrd; Sketch; Mix  Patrick Jouin; Las Vegas, NV in David Kaufman, "Cloud Nine," Interior Design 76, no. 3 (Mar. 2005): 168-172; PhotoCrd: Eric Laignel; Restaurant, Amerigo Hotel  Elvira Blanco; Alicante, Spain in Stacy Shoemaker, "Divine Inspiration," Hospitality Design 28 no. 1 (Jan./Feb. 2006): 64-69; PhotoCrd: Hospes Hotel. 2) Cho, Jasmin. “Theory Studies: Archetypical Practices of Contemporary Restaurant Design.” M.A. Thesis, Cornell University, 2009, 38-45.